If you follow the blog or my insta-stories, you’ll know we’ve been making the most of UK travel lately, with short getaways. With a toddler, a dog and our own businesses to juggle, big long-haul holidays are not quite as easy as they once were. And with a renovation going on, we’ve needed a bit of time to recoup and spend some time together as a family. So our recent trip to Yorkshire, was just that…it was time for just me and hubby to enjoy each other’s company and have some time away from all the stresses of everyday life. On arrival, the Ox Pasture Hall Hotel has the wow-factor, as you make your way up a long drive and the quintessential Yorkshire-stoned building is revealed. We were lucky enough to have some seriously good weather too, so got very excited when we saw the sprawling grounds and immediately made our way to the bar, ordered a Pimms and sat outdoors, soaking up the last few hours of sunshine. But first things first, I’ll tell you about the rooms. We stayed in one of the cottage buildings, which houses the impressive suites. Ours was on the ground floor and overlooked the inner courtyard from one window and the sprawling countryside from the other. We had a separate lounge and TV area, a generous bathroom with separate walk-in shower and a large bedroom with an incredibly comfortable bed (all the more important when you’re used to sharing it with a fidgety toddler). After having enjoyed a day in Whitby (read more about my top things to do there), we were keen to relax at Ox Pasture Hall Hotel, enjoy a long leisurely dinner and snuggle up in front of the telly with a bottle (or two) of wine. We reserved our table for dinner and after a couple of hours relaxing, made our way down to the hotel bar where we were offered the Tasting Menu to peruse…6 courses to whet our appetite! 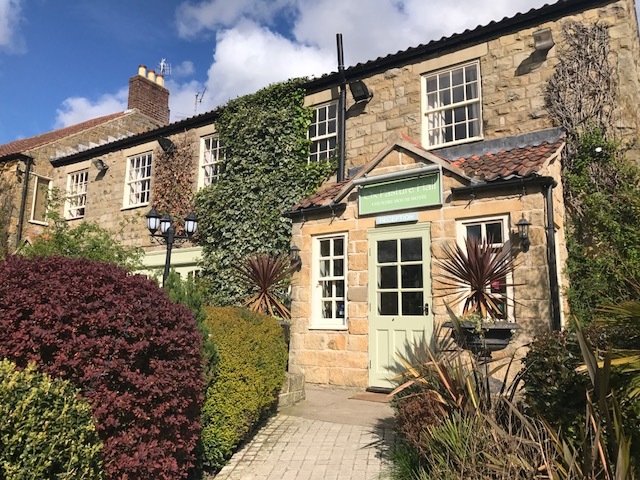 Having spoken to the General Manager and the F&B Manager, we quickly realised that food and drink, with locally sourced ingredients, was of utmost importance to the new look Ox Pasture Hall Hotel. We spoke at length about the menu and the Chef’s plans to really put the hotel on the culinary map in Yorkshire. We teamed our tasting menu with a flight of wines (naturally), incredibly well matched and adding to the luxurious, leisurely dining experience we had craved. What a total surprise. Reading it on the menu it sounds nice but you think “how much can they do with an onion?”. Well a lot! The mousse was smooth and creamy with definite flavours of onion, with the tart pickled radish to balance. There was just the right amount of char on the onions to give texture and taste and the Pinot Grigio complemented it perfectly with it’s zesty, fresh body. Again, mackerel wouldn’t be my natural choice on the menu and that’s the beauty of tasting menus…you try something a bit different. Well this was delicious and served to beautifully. The mackerel was smokey and flakey and the confit celeriac and textures on the plate made for an interesting feast. The Riesling was the right match and I’ve never had a Kiwi Riesling before and it’s something I’ll definitely be looking to add to the wine fridge at home! This was an unusual but delicious combination and the pickled blackberry works well with the rare beef, the variety of carrot and the pommes Anna. The jus gave just the right amount of wet on the plate and the light but full-flavoured Malbec was an ideal partner to the beef. My only note on this dish, was I wanted more stickiness of the treacle coming through on the beef. For me, a lemon dessert to finish a meal is always a winner! And the Chef at Ox Pasture Hall Hotel does something slightly different with the fruit. We had it served in cake form, flavoured with olive oil – delicious! The lemon was particularly tart with the raspberry curd, but the matched Prosecco cut through it perfectly. In fact, Prosecco and lemon cake really is the most perfect combination. I could have happily eaten the cake with the ice cream on its own. Ok, so when this thing of beauty was wheeled out, we had a lot of envious stares and comments from our fellow diners. We felt very important and chuffed with ourselves…I mean look at it! We were talked through the aray of cheeses, all British, laid out in front of us. We were surprised to hear that they weren’t all French and eagerly awaited our opportunity to dive in. The cheeses were of varying strengths and type, so we made our choices, which were served for us alongside homemade chutney and crackers (and plenty of them!). A good cheese board, washed down with a small glass of Port really is the perfect end to a perfect meal! Hold on! What did I just say? The perfect end to a perfect meal? Well, when our waitress chuckled away and mentioned that there was just “one more surprise” coming our way, we didn’t know how we’d fit it in! But somehow, we always manage to make more room and I’m so glad we did and these little lollipops were delightful! One was dark chocolate and encased a punchy raspberry sorbet and the other (my favourite) was the ideal combination of white chocolate and passion fruit! Wow – thank you Ox Pasture Hall Hotel…that really was the perfect end to a perfect meal! Well what’s more to say? Ox Pasture Hall Hotel is a fantastic, friendly and comfortable place to stay and to top it all off, has an amazing Chef and some seriously delicious food. The perfect place for a UK getaway or mini-break with your significant other, family or friends. We can’t wait to go back with our daughter as we know she’ll love exploring the 20 acres of land and feeding the ducks in the pond. There’s only one way to finish this post…with a little video! Ox Pasture Hall Hotel from Holly Wood on Vimeo. Do you like to travel in the UK? Where do you go for a short get away?